'Pon Pottaal Pon Vilaiyum Bhoomi' meaning: 'If gold is sown the land yields gold'- this is the maxim used to define the fertile lands in Trichy district. The shimmering green banana plantations in this region fed with the waters of river Akhanda Kaveri is a bonanza yielding green gold in the form of healthy nutritious banans. 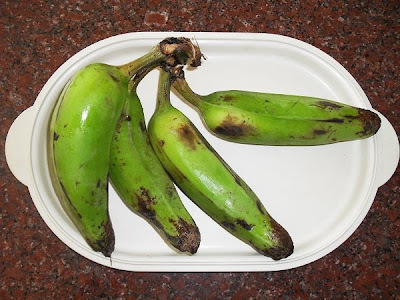 The raw bananas known as 'mondan vazhai' are ideal to prepare chips, kootus, porials, bajjis and kuzhambus. Bananas raw or ripe have numerous health benifits. 1. Soak tamarind in warm water and extract the juice and keep aside. 2. Chop onions and ginger finely. 3. Break red chillies and slit the green chilly. 5. Heat oil in a pan and add the mustard seeds. 6. When the mustard seeds splutter add fenugreek seeds followed by bengal gram dal. 7. Fry till the seasoning becomes reddish in colour giving out a pleasant aroma. 8. Add red chillies and fry till crisp. 9. Add green chillies, ginger and curry leaves followed by asafoetida. 10. At this stage add chopped onions and saute if desired.Or you may skip this step. 11. Add turmeric powder and stir well. 12. Pour in the tamarind juice along with the cut banana fingers. 13. 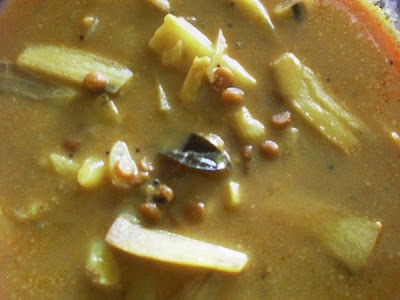 Add salt, sambar powder and jaggery. 14. Let the kuzhambu boil on medium flame, stir now and then till the bananas are cooked. 15.The quantitiy of tamarind juice will reduce a little by the time the bananas are cooked, hence adjust the quantity by adding 1/2 a cup of water or more according to your taste. 16. Make a paste by mixing rice flour with little water and add it to the boiling kuzhambu. 17. Switch off flame when the kuzhambu thickens. 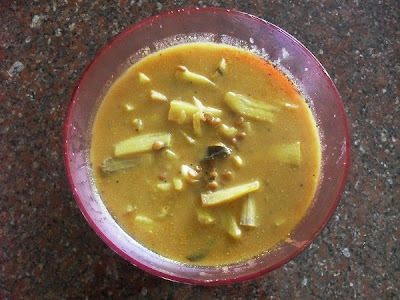 Enjoy the Vazhaikai Puli Kuzhambu with steaming hot rice topped with a dollop of pure ghee. It is a good accompaniment for coconut rice, ven pongal or any other tiffin. Love this pulikozhambu. specially the chunky vazhaikka pieces saturated with the tangy gravy. Lovely dish, very tempting kuzhambu..